If you would like to join us in the walk, please click the link below to sign up for Team JJ's WHOLE heart. July 9, 2018 our lives changed forever. Our handsome, healthy baby boy was born. Jeffrey James, JJ, would become the center of our entire universe. As we prepared to take our new bundle of joy home on Tuesday July 11th, the doctor came to deliver us some devastating news. I will never forget the six words that shattered my world "Your son has a heart defect". What? How? My pregnancy was perfect. Every test "looked good". This could not be possible. The doctors informed us that they were still uncertain of exactly what was wrong. They explained that congenital heart defects range in severity. We were informed that he would need to undergo multiple tests before the cardiologist could decipher exactly what was wrong. After what seemed like an eternity, we were greeted by one of the sweetest Cardiologists in Pittsburgh. She told us that the defect JJ had was one of the more common heart defects, PDA (Patenet ductus arteriosus). PDA is an opening near the heart, which fails to close after birth. This caused JJ to struggle breathing because his lungs were working overtime. For the next 7 days, JJ fought hard to get off oxygen and breath on his own. Those 7 days were the hardest days of my life. My son had IV's in his hand, and head which he constantly tried ripping out. I watched my baby boy struggle to feed, to sleep, to breath for 7 whole days JJ still has the "hole" in his heart. Although the whole is not getting any smaller, he is getting much bigger. 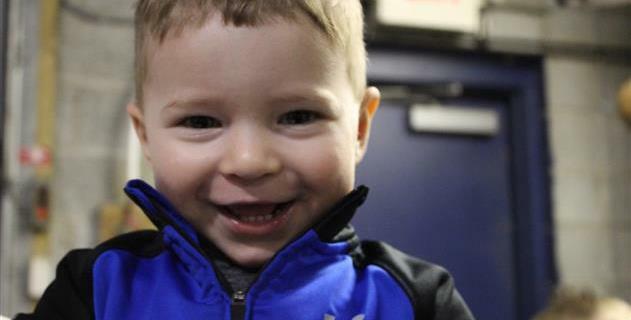 JJ's heart defect will not affect him while playing sports, or swimming or riding bikes. JJ's life is full of love and our hearts are too.